David Fincher makes a lot of good films, but in his best films, he seems to be having wicked fun. Such is the case with Gone Girl. Don’t let the trailers fool you. This is not a dour whodunit tragedy. It’s a brightly crafted melodrama that embraces its pulpy center as lovingly as its razor sharp edges. Infused with acerbic wit and delivered with stellar performances, Gone Girl is an absorbing twist-and-turn-athon and a ton of fun. Ben Affleck stars as Nick Dunne, suspect #1 in the disappearance of his beautiful wife Amy (Rosamund Pike), and he’s never been better. That’s not such a strong statement, because in general his performances are blandly likeable, but here he’s able to channel his inner douchiness and it works wonders. He’s the exact mix of endearing everyman and disappointing schmuck the film needs to work. But Pike is the reason to watch this movie. It’s easy to see why every heavy hitter in Hollywood – including the film’s producer Reese Witherspoon – banged on Fincher’s door in search of this role. Amy Dunne is a hell of a character and Rosamund Pike gives a hell of a performance – fluid enough to meet the high, constantly changing demands. Fincher’s casting throughout is slyly wonderful, with unexpected faces in exactly the right roles. Tyler Perry is a hoot as Nick’s high-powered ambulance chaser and Neil Patrick Harris is just as unconventionally cast and just as enjoyably spot-on. Fincher takes aim at current American culture – tragedy groupies, local law enforcement, the media and Nancy Grace-style “news” programs, in particular – and scores bull’s eyes every time. It gives the film an air of self-satisfaction, sure, but the barbs are so very precise and relevant that any smugness can be forgiven. Fincher’s craft is on full display here, dreamily weaving multiple points of view and saturating the mystery with wit and tension. What feels stilted and flat in early scenes evolves into a series of “aha!” moments for viewers. 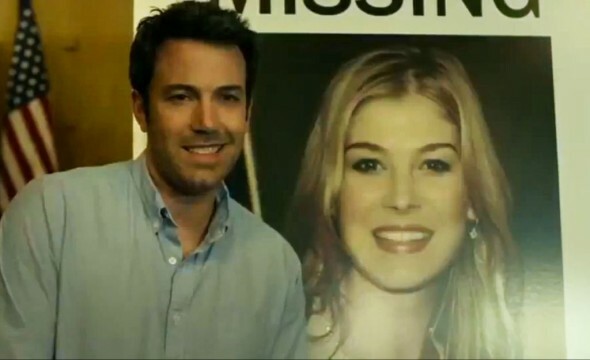 Gone Girl is not a heavy, thoughtful awards season drama. At its heart, it’s paperback trash, and in Fincher’s exceedingly capable hands, that’s all it needs to be to amount to a memorable, satisfying, constantly surprising movie.